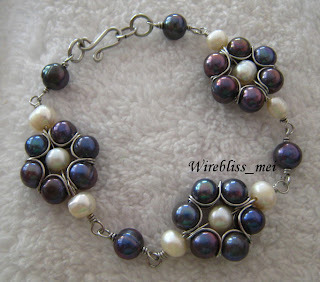 This bracelet is made for my sister in-law to go with this necklace. Since I made this necklace about 2 months ago, I must admit that I barely remember how to start with this flower formation...lol. Old age :). Anyway, she relayed some good news to me last night. Seems that some of my handcrafted wire jewelry pieces are selling well in Calgary :). You see, when she left Kuching last September, she took some of my pretties with her saying that she would help me sell them there. Sold them she did! Thank you, thank you! Chea.